NOTE: If you're using Drupal 6.x, please go to the Drupal Administer >> Site Building >> Themes >> find the basic theme >> click Configure and scroll page down >> click "Edit theme". In Drupal 6.x, you can change the Headline and Slogan text under the Administer >> Site Configuration >> Site Information: Name and Slogan options. The Logo control image specified in Themler can be overridden via the Drupal admin panel under the Appearance >> theme Settings. In Drupal 6.x, you can change the Logo image under the Drupal Administer >> Themes >> configue >> disable "Use the default logo" and specify the path or upload the image. The Drupal theme consists of two themes: basic and preview. You will see the preview theme in the Themler preview area, and if you click Live Preview. This allows you to make changes to the theme and preview them in your browser without saving. Therefore, if you assign any Drupal Blocks to the theme's regions, you should do it for both themes (basic and preview). Also, when you add a new region in Themler we suggest that you clear Drupal cache under the Drupal Configuration >> Performance. Horizontal Menu is the main website navigation section. To add a Horizontal menu to your website, you should add the Horizontal Menu control to a location where you would like to place the menu. This control creates a specific region (e.g. Horizontal Menu 1) where you can add a menu block in Drupal Structure >> Blocks. Normally the Vertical Menu is a secondary website navigation section. To add a Vertical Menu to your website, you should add the Vertical Menu Region control to a location where you would like to place the menu, This control creates a specific region (e.g. Vertical Menu 1) where you can add a menu block in Drupal Structure >> Blocks. The Top Menu is an additional navigation menu normally used for internal website links (Login, My Account, etc.). To add a Top Menu to your website, you should add the Top Menu control to a location where you would like to place the menu. This control creates a specific region (e.g. 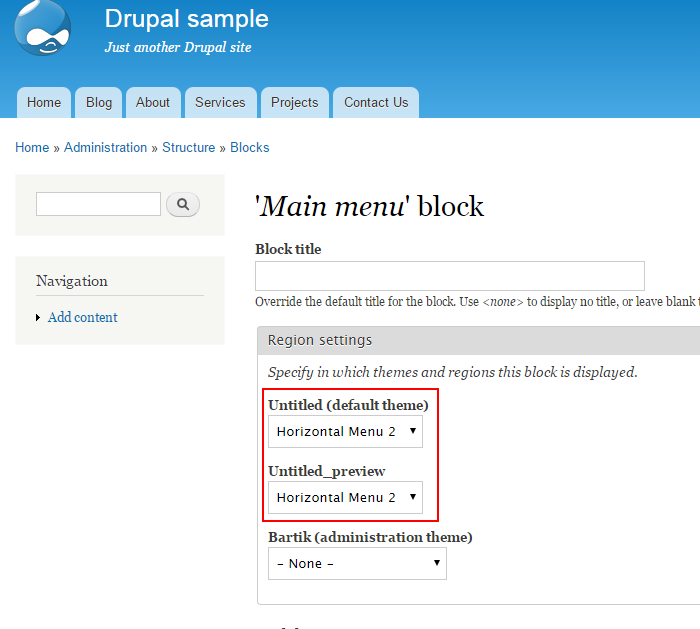 Top Menu 1) where you can add a menu block in Drupal Structure >> Blocks.